357/365 – “Meet Shadow” nr.23, a photo by Luca Rossini on Flickr. Twenty third day of “Meet Shadow”. A day without rain. Something precious these days. Good for a longer walk. We crossed the bridge that goes to Testaccio, walked into the ex-slaughterhouse in the area now overseen by the “Città dell’Altra Economia” (the other-economy city). It’s a weirdly nice area, still without a clear identity but nevertheless nice. 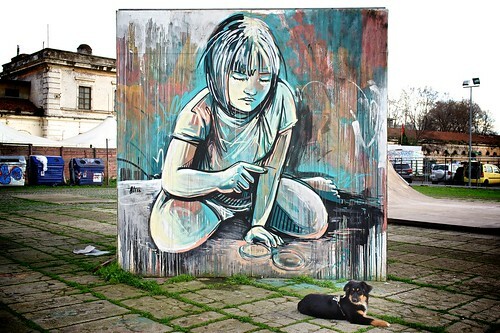 Apparently Ombra loves street art, or giant kids, since she rested there for quite some time. While I enjoyed the weather: no rain.